Want to be notified of new releases in louisvillemetro-innovation/docker-cartodb? Pull request Compare This branch is 4 commits behind chriswhong:master. 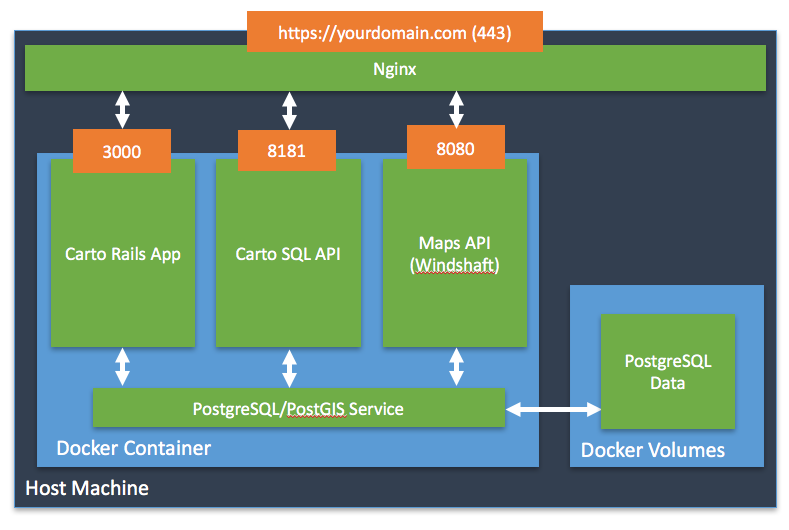 This is a dockerized production Carto(DB) installation, based on the official Carto Installation Documentation, using the latest dependencies including ogr2ogr2.1. You should be able to map most of the steps in the Dockerfile with those on the install documentation. The steps below were written with a Digital Ocean droplet (docker pre-installed) in mind. This Dockerfile assumes you want to run Carto with SSL, which requires a few configuration steps beyond just building the docker container. The biggest difference from other Dockerfiles is setting the production environment variables, and then adding ssl certificates to the nginx configuration. This build also makes use of Docker volumes, so that the the data can persist. This should allow for an easier upgrade path when new versions of the core components are release. We have had success installing Carto in a Docker container on a Digital Ocean droplet with 8GB of Ram, 80GB Storage and 4 cores, which runs $80/month. You can choose an Ubuntu 16.04 image with Docker preinstalled and save yourself some time. SSH into that bad boy and get ready to Docker. You will need a FQDN with an A record pointing to your server's IP address. You need to edit config/app_config.sample.yml, and replace every instance of 'yourdomain.com' with your domain name and save the file as app_config.yml. The dockerfile will insert this into the new container during the build process. This command runs the container with the three main services mapped to the host machine. 3000 for the frontend, 8080 for the Windshaft Map Tiler (Maps API), and 8181 for the SQL API. Use docker run -d -p 3000:3000 -p 8080:8080 -p 8181:8181 cartodb the first time you run it. Install nginx apt-get install nginx and then copy config/cartodb.nginx.proxy.conf from this repo to /etc/nginx/conf.d/. Edit the file to include your production domain name and the paths to the SSL certificates. The Dockerfile will create a user named admin with a default password of pass1234. You should change this when you first login. This can also be done in nginx, you just need to enable gzip and add the mime types that carto uses. First and foremost, thank you to the Carto team for such a great product that is also open source! This Dockerfile was inspired by and largely based on Stefan Verhoeven's image. I could not get it working and descided to start over using the official installation docs. All of the configs are borrowed directly from his. Pull requests and issues welcomed! If this doesn't work for you, please open an issue and let's figure out why.